The Kansas Department of Agriculture has announced that they will be accepting the label required Dicamba specific training online in the State of Kansas starting April 1 for the dicamba products approved for use on Xtend crops. KDA has stipulated that the online training must have accountability built in to ensure that an individual must participate in the training module. On-line training is offered by some of the surrounding states, as well as from Monsanto, BASF, and Dow DuPont. If you have any further questions please feel free to contact me at my office. My office number is 316-284-6930 or email is flaming@ksu.edu. Harvey County, Kansas: This column is not about trees, shrubs or vegetables, but it could be! If you would like to start a project but need funding this may be a great way to learn how to find funds. Strengthening communities: Grant writing workshop planned. Do you know how that community garden was started or how the playground equipment at the park down the street was purchased? Or the new sign leading visitors to a local landmark? How about initial money for a festival? In any community, chances are that someone, or a group of individuals, wrote a grant proposal and received funding to help with the project. On Friday, March 2, 2018, the Department of Animal Sciences & Industry at Kansas State University will proudly continue its tradition of the Cattlemen’s Day program. This program is designed to provide producers, allied industry and individuals with information about new developments in the beef industry. The entire day’s program will be held at Weber Hall. Weber Hall is located at 1424 Claflin Road which is in the northeast corner of the K-State campus on Claflin Road on the K-State Campus in Manhattan. Cattlemen’s Day 2018 will begin with the morning program, including featured speakers from Kansas State University followed by the “Focus Sessions” in the afternoon. The program will be held in various rooms throughout Weber Hall. The outstanding Cattlemen’s Day program will be coming soon to our web site at: www.asi.ksu.edu/cattlemensday. The day will conclude with the Legacy Bull Sale and a social after the sale at the Stanley Stout Livestock Marketing and Learning Center. All commercial exhibits will be housed in Weber Arena. We heard very positive comments last year and are looking forward to an even bigger and better Cattlemen’s Day 2018. The Harvey County Master Gardener volunteers have been working feverishly to prepare for the Harvey County Home and Garden Show! The speaker schedule is set! Plan to come and learn on March 10 and 11! 12:00 Lunch – Mi Mama’s Recipe’s! How Gardeners Can Save The World! K-State Research and Extension, Butler Co. Admission is only one dollar. We have door prizes, kids events each day, outstanding vendors and awesome food available from Mi Mama’s! We still have room for more vendors. Contact Scott Eckert at 316-284-6930. *There will be Cover Crop Update on Wednesday, Feb. 21 at 1:00 PM to 4:00 PM, in the Harvey County Courthouse Community Rooms, located in the basement of the Courthouse, 800 N Main, Newton. Entrance is the front doors of the building, facing west or Main street. 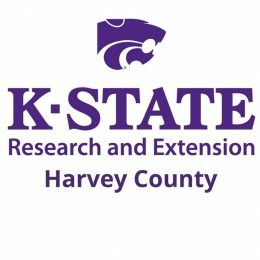 Jaymelynn Farney, Kansas State University Assistant Professor and Extension Specialist will be presenting the program. It will include “How to Safely rotate livestock on Cover Crops” and “What types of cover crops to plant for rotation”. There is no fee for this update. 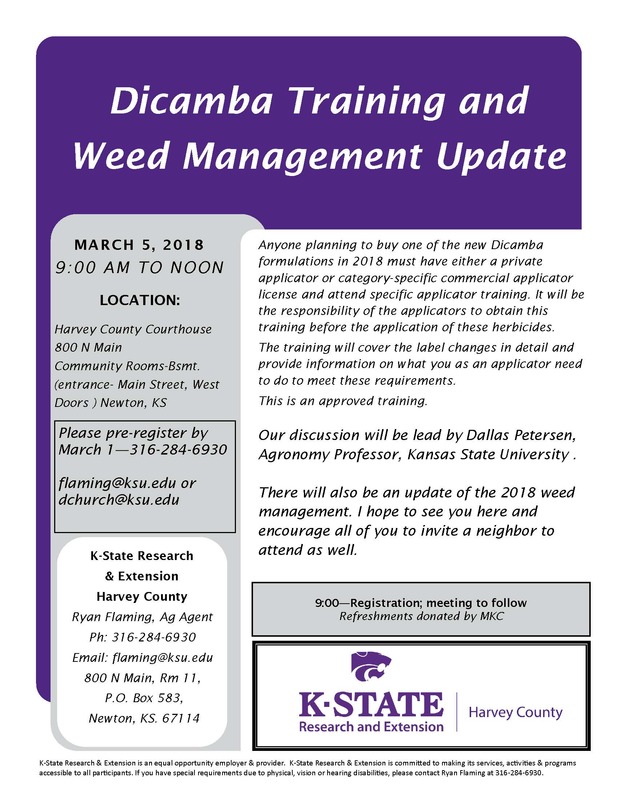 *A very important meeting on Dicamba Training and Weed Management will be held on Monday, March 5, 9:00 AM to Noon, at the Harvey County Courthouse Community Rooms, Basement of the Courthouse. This meeting will be presented by Dallas Petersen, Kansas State University Agronomy Professor. Anyone planning to buy one of the new Dicamba formulations in 2018 must have either a private applicator or category-specific applicator training. It is the responsibility of the applicators to obtain this training BEFORE the application of these herbicides. The training will cover the label changes in detail and provide information on what you as an applicator need to do to meet these requirements. This is an approved training. There is no fee for this update. Please PRE-REGISTER by March 1 by calling the Extension office at 316-284-6930. If you have any questions regarding either meeting you may call me at the office at 316-284-6930 or email is flaming@ksu.edu. I look forward to seeing you at these meetings.